Some Picturesque Characteristics of the Little Fellows Who Sell “Uxtrys” in the Streets of New-York. Whatever the newsboy may lack in appearance, he has a bottom all the instincts of an aristocrat. Let the sunshine of prosperity beam on him even for a moment, and he buds with the true flowers of a patrician. If he makes a couple of dollars by the help of the Japanese fleet, whose latest manoeuvres has furnished him with a startling bit of news, he spends his money with a lavish hand. instead of a box at the opera, he buys tickets for the “gang” just beneath the grimy roof of some Bowery theatre. The obstacles, however, which beset his ambition seem almost insurmountable. like Mr. Got-Rich-Quick, who moves to New-York from Petroleum Creek, and who is surprised to find the doors of Gotham’s best society closed against him, his aspirations suffer many a rebuff. The tenants of “de ate swell deckers” guard the dignity of their social rank with jealous circumspection, and even when a bed becomes vacant and Superintendent Heig sends in a new boy, the other seven at first regard him as a upstart. Although some of the “Waldorf Gang” are earning enough money to hire a furnished room uptown, they find the attractions of their present life too potent. “We’d rather be the main guys here,” as one of them expressed it, “than be an under dog at a cheap boarding house.” Nevertheless, when the superintendent finds that a youth has prospered sufficiently to make his home elsewhere and let some other lad rise to take his place, he transplants the graduate into a good home, where, under the right influences, he can strive for still higher ideals. 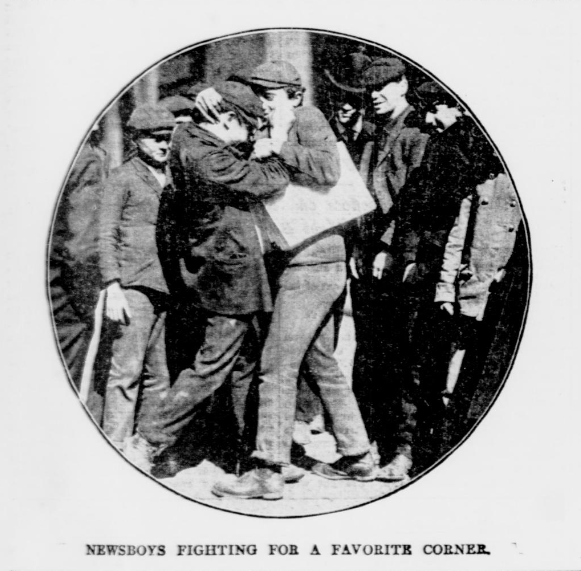 It was just half a century ago that the Chatham Square Newsboys’ Lodging House was founded by Charles Loring Brace. It was the first institution of its kind in the United States. The building was erected by private subscription, and was managed by Mr. Brace for some time before it was accepted by the Children’s Aid Society, of which Mr. Brace was the executive officer. Since then other lodging houses have been established by the society, and in its last report, which covers fifty years of work, this organization tells of having rescued and placed in family homes 23,61 orphans or abandoned children provided places in the country for 25,000 older boys and girls, and restored 5,551 runaway children to parents. The vast majority of those sent to family homes in the West have become farmers, and not a few have risen to stations of high responsibility. John Q. Brady, Governor of Alaska, for instance, was once a lodging house boy, and others whose careers are known to the society include two Congressmen, four members of State legislatures, twenty-seven bankers, thirty-four lawyers, twenty-two merchants, seventeen physicians, fifteen journalists, eighty-one teachers, twenty-one clergymen and more than a thousand soldiers and sailors. 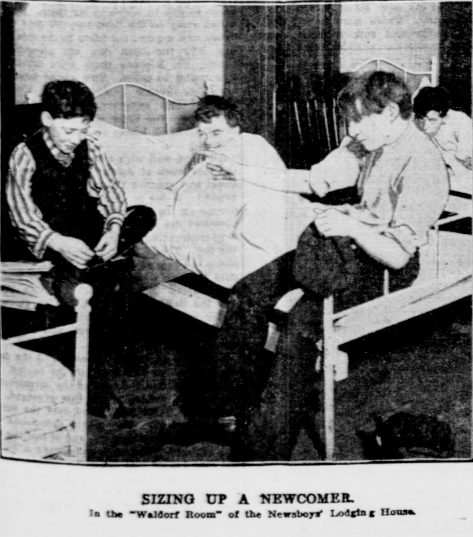 Between two and three hundred lads make their home in the Chatham Square Lodging House every night. As they file into the assembly hall, in the half hour before 6 o’clock, each reports to the superintendent. If a lad is working, he hands 15, 20 or 25 cents to the superintendent for three brass checks and a key. The checks for breakfast and supper cost only a nickel apiece, and the bed check varies from 5 to 15 cents. The minimum amount for a week’s board and lodging is $1.05. Near the superintendent’s desk, as if to invite the attention of everyone that enters, is a shallow, black box, the top of which is cut with rows of slots, each labelled with a number.As the lads pass by nearly every one goes down into his pocket and drops a few coins into a certain slot. 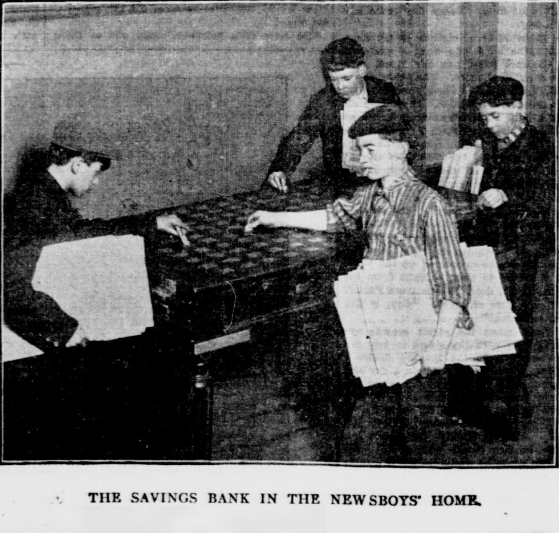 Whenever a lad wants his savings, Mr. Heig opens the bank, and sometimes he takes out as much as $30. In the last year 139 depositors saved $500.74. Not infrequently the money is transferred to a savings bank, and Mr. Heig has one bankbook in this possession which has just reached the thousand dollar mark. In every way the boys are made to understand that the lodging house is not an institution of charity. They pay or work for all they get. If a lad comes in penniless he is put to work cleaning windows or scrubbing floors. But his pride soon drives him to get employment. The lads earning money call him a “bum,” and he jumps at the first job which is offered to him. He need not wait long. Every day some one applies for a boy. On rainy days, when the street crowds are too busy struggling with the storm to buy papers, the newsboy finds the lodging house a veritable haven. Here he may obtain a dry and sheltered corner, and in the evening when his legs ache from tramping the pavements he can play checkers or pool or listen to comrades as they sing to the accompaniment of the big, square piano. And if “Paddy the Pug,” the leader of the lodging house chorus, lifts his voice, as he can when he wants to, till it sounds as clear and sweet as that of a vested chorister, and sings that favorite of all newsboy songs, “The Man Behind,” he will join in the refrain. Then he forgets all about the fight he had in a back street an hour ago, and the blow that made his temple bleed. Behind him are the wardmen and the wise old roundsmen, too. But the man who gets the money is the man behind the green. He’s the wisest man that you will every find. So always try to be the man behind. At the lodging house the “newsie” is safe from gambling resorts, which have a particular charm for him. 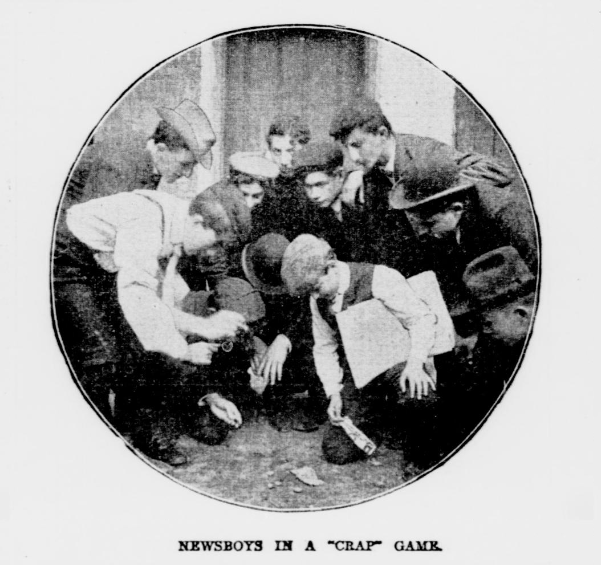 In Broome-st., Henry-st., at Sixth-ave, and Twenty-eighth-st., Forty-second-st. and Third-ave., Fifty-ninth-st. and Third-ave., and many other places where the newsboy may buy policy tickets, shoot craps or play poker. There are pool tables at a cent a cue, where the lads bet five cents or more on each game, and where in a few hours a boy who has earned $1 in the day may lose everything he has. And when such a lad does not find a pool-room convenient he uses the sidewalk for a gambling place. He carries all the necessary paraphernalia for a crap game in his pocket, and it takes only a minute to summon the “bunch” around the corner into a less frequented street, where the dice are soon rattling over the asphalt. There is a certain professional pride in the newsboy of this city. He realizes that he lives in the biggest and wealthiest community of the New World, and that he must use his brains to get ahead.